”It doesn’t really work for my business”. I am always telling you that to get customers and make your website visible you must deliver free content that’s inspiring, interesting and useful. But what if you sell shoes or insurance or accountancy advice? Many people think their business it too boring… or that content doesn’t apply because they’re “just a shop”… or that their customers don’t want advice or entertainment. To illustrate, let me give you an example from a shop that sells… bed linen. As you know, one of the fastest ways to become successful online is to see what’s working elsewhere… then use those principles and techniques for your own business. Just work out how that business is getting people to their website. How do they convert visitors into customers and then hang onto them? The winner of the best online small businesswent to two sisters who set up on their own in 2013. So that’s 5 years going from a business that does NOT EXIST to selling products and winning a national award. What’s more, their product is – at heart – not hugely exciting, original OR something you’d expect to work well with content marketing. Really, it’s just bed sheets. But they are doing something right. So let’s see what we can learn. The aroma of it led them talk about those lovely moments in bed in the mornings before the day begins. They had some experience in textiles, so they came up with the idea for the Secret Linen Store. They sell all their products online, through their website www.secretlinenstore.com. By not having stores, they can keep their costs down and it has allowed them to get set up and running very quickly. And consider that BED LINEN is, on the surface, quite a boring product. 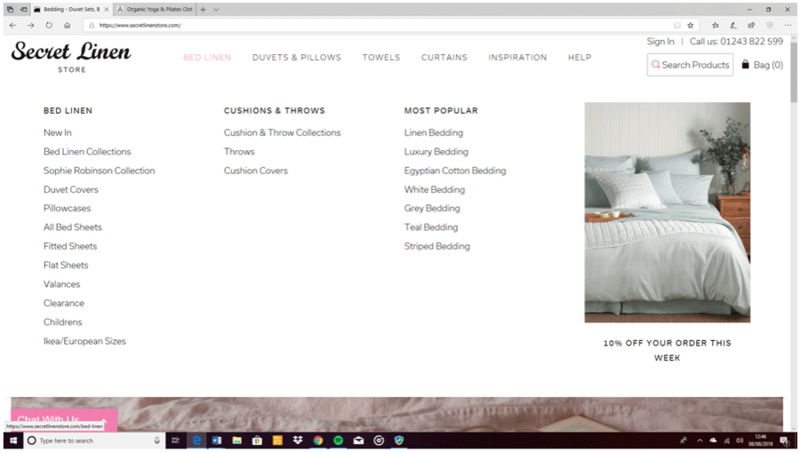 The first things you see on their home page are product images, which for this kind of business selling fabrics, is essential and what you’d expect. 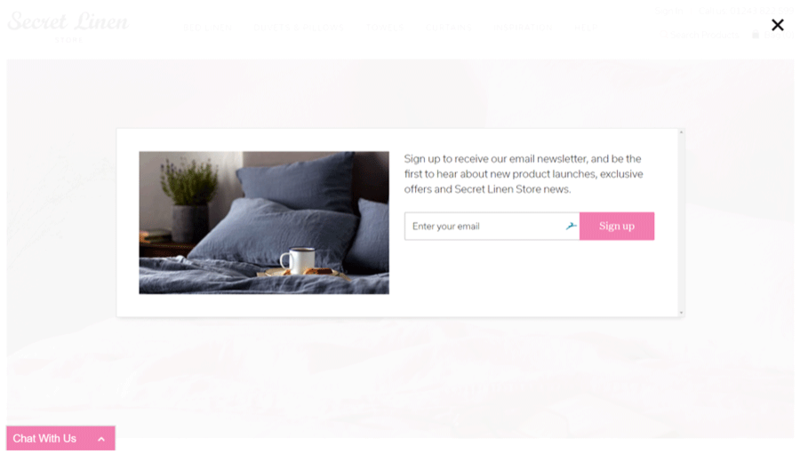 However, let’s look at some of the other elements which apply to any online business… and which Secret Linen use to make their sales pitch more interesting. Benefits – they make sure they tell you why this is a website worth sticking around for. Each of these clickable tabs links to a huge article for each benefit, with all the proof you need. The warm, friendly photos of the two women behind the business increases trust and credibility, making this a personal, unique business. Backstory – to deepen the relationship and the personal touch they include a brief backstory on their homepage. There is also a longer more detailed story on the About Us page. As well as the information on the home page, they make sure that they can keep customers informed, enlightened and entertained. A pop up encourages visitors to get their email address down. Their offer is that you’ll get advance offers, news of new launches and other benefits. They’re on an array of networks, including Facebook, Twitter, Instagram, Pinterest and Google +. It takes you behind the scenes of the business, for instance there’s a post about their photographer. And it even offers affiliate backlinks to associated businesses who have products that may be relevant to their website readers. For instance, this free content post also contains a link to a Yoga and Pilates company. In summary, there are interviews, guest posts, recommendations, recipes, tips and advice on this blog, giving it the feel of a free lifestyle magazine. They even have a whole separate blog called ‘Snooze’ dedicated to advice on getting better sleep. 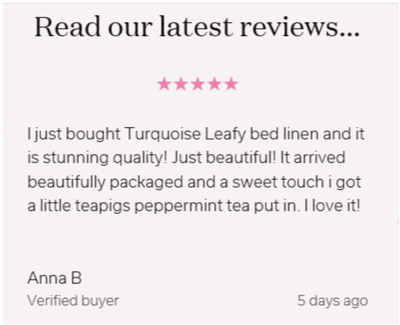 An estimated 16 million UK adults suffer from sleepless nights and a third have insomnia, so this is a very clever idea… bringing a health and wellbeing element into what is effectively a linen shop! This really is free content in glorious action. How many of these elements do you have on your website? What’s more, does your website cover all the themes and advice that really matter to your customers? Whatever you sell, however ‘everyday’ or dull you might think it is, there is a way to personalised your website and provide your potential customer with life enriching advice. The post Case Study: How They Turned this ‘Boring’ Product into a Brilliant Website appeared first on Digital Upstart.